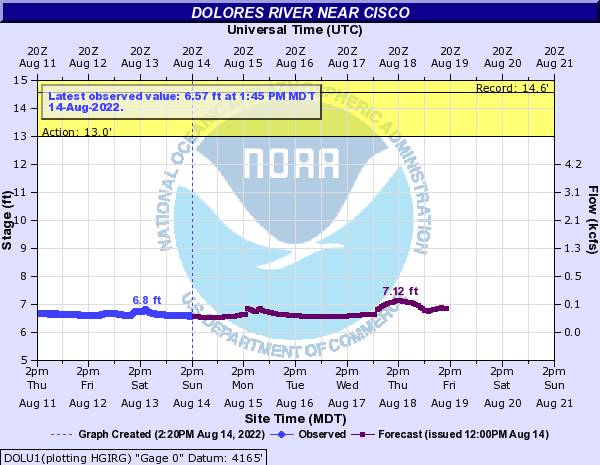 This last stretch of the Dolores before joining the Colorado River lives in a remote section of Colorado and Utah. This is mainly a class II to III run with one IV rapid at the stateline. Again the hardest part of running the Dolores is catching it when there is water. This makes for a short season. The shuttle is extremely long so you may want to check into a shuttle company. See here for access description. This is a good ramp with pit toilets just down stream of the Dewey Bridge on the Colorado River. It can get crowded here so take only 1 ramp lane and get on or off the river. Many commercial companies use this area as well so be respectful.